Yeah, I’m back at work on “Hockey, Love, & GUTS!” and it feels great once again! 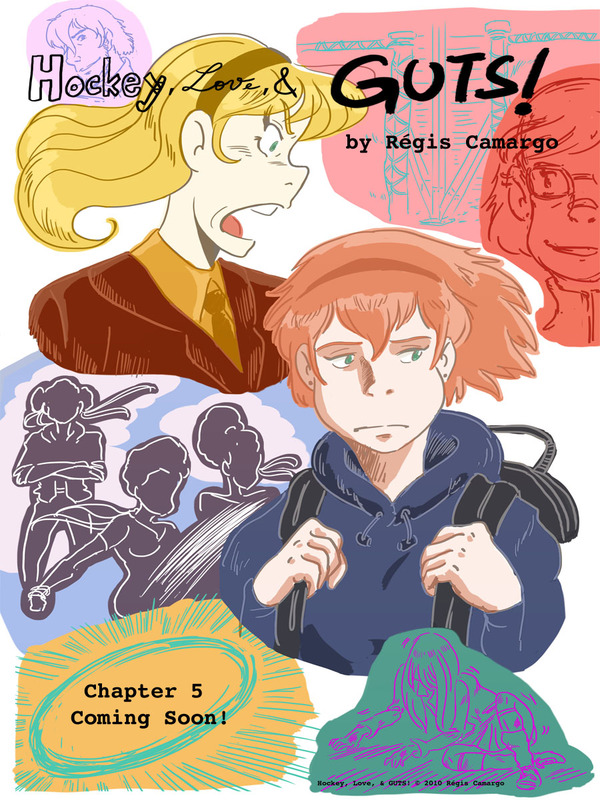 I can’t believe it’s been 6 months since the last installment, and unfortunately, it might be a few more until the next (I’m hoping to have chapter 5 done by early December… crossing my fingers here.) Thumbnails and script are done, and I’m a few pages into the roughs now. It’s 35 pages, and it seems that chapters are getting longer and longer! I really gotta find a good page length so I can put them out faster (15-20 pages is just fine, but I really needed all of these 35 pages to be chapter 5, so sorry.) Anyway, here’s a teaser. I thought the scrapbook concept matches the high school girl drama… maybe. Well, I was also scrambling to do something quick and in color, and this is what came out. But, the comic will still be in black & white – (also, Mercedes is blond here, but she’s supposed to be somewhere between a blond and a red head… or maybe she’ll stay a blond… still thinking about that – I guess that is one of the cool things about making a black & white comic in a serialized manner: there is still a lot of experimentation going on) – so, don’t expect a color comic all of a sudden. Though I may make these teasers a more frequent thing, so if you like this, let me know. I’m gonna be going to Japan in a couple of weeks! I’ll be there for almost 3 weeks, so no posts for a while – then again, considering my consistency of posts here, you may not even notice :/. But, maybe I’ll do another post right before I leave, a “one for the road” so to speak… After all, this is a trip I’ve been planning on doing for 10 years! It also so happens that this is my honeymoon, so I gotta give it up to my wife for letting me chose the place for the occasion.